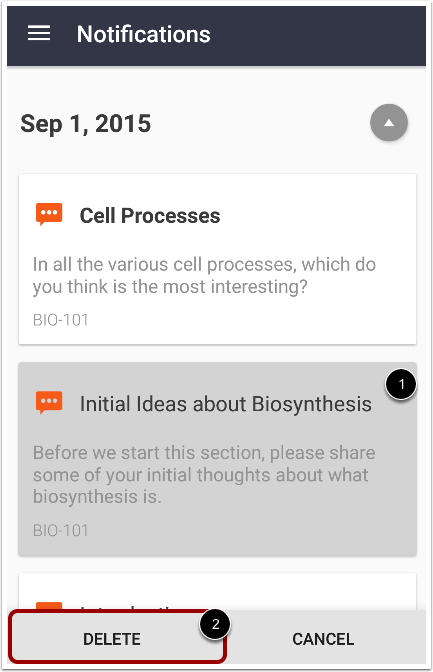 Canvas lets you view notification items in your Canvas course. 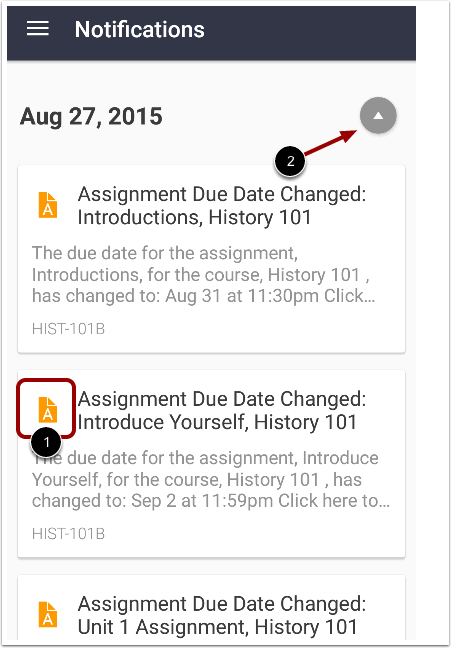 Notifications give you an overview of all course notifications such as changes to an assignment due date, newly created assignment, course announcement, or a reply to a subscribed discussion. You can interact directly with any items that appear within notifications. 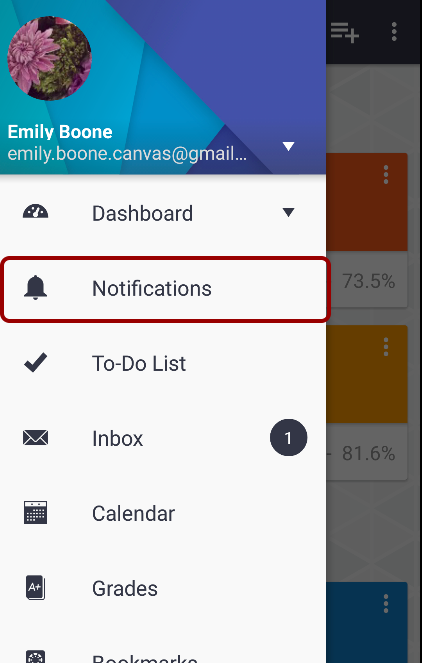 You can also set Notification Preferences in the app to receive push notifications for Canvas activity on your mobile phone. Notes: The images in this lesson are shown for a phone display. 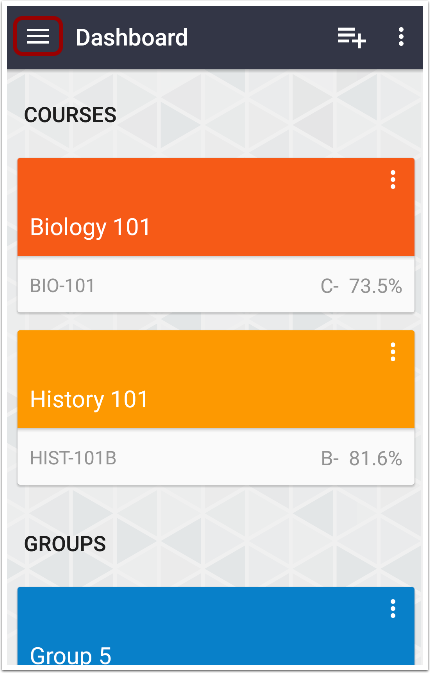 Notifications can also be viewed as a Course Navigation link, which is similar to the Syllabus link, but it is not part of the standard Course Navigation menu. The Notifications link is specific to Android devices and cannot be hidden in the Canvas app. 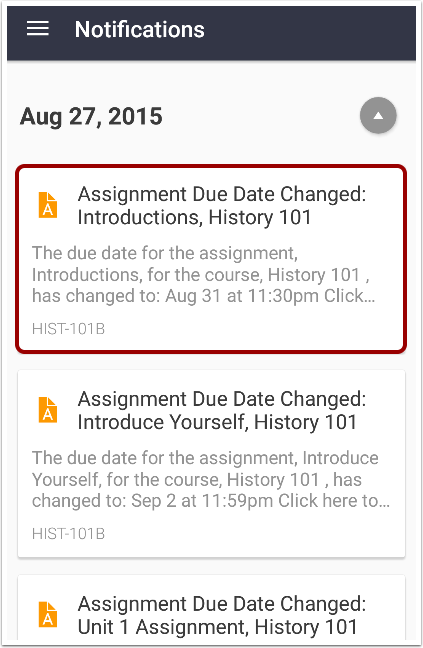 Notifications provide you an overview of all course notifications such as changes to an assignment due date, newly created assignment, course announcement, conference invitation, or a reply to a subscribed discussion. Each item is color-coordinated according to course or group and displays an icon for its activity type . Items are organized by date. To collapse and expand to-do items for a specific date, toggle the date arrow . To view a notification item, tap the name of the item. The app will redirect to the notification's corresponding page. To remove a notification, tap and hold the notification . Tap the Delete button .